An ad for the Paasche "Model D" from the 1915 book "Treatise on the Air Brush" by Samuel W. Frazer. It was self published. The "Model D" is the forerunner of the "Type H." It's unique in that it's a double action external mix. 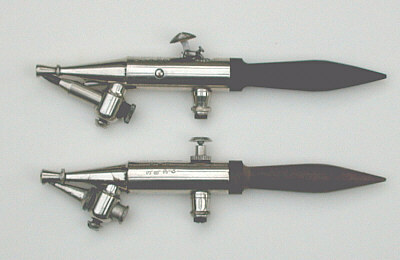 The pictures below the ad show a close up of the color adjusting part and a comparison of a double action and single action external mix Paasche airbrushes. The arrow shows the mechanism that adjusts the color flow. 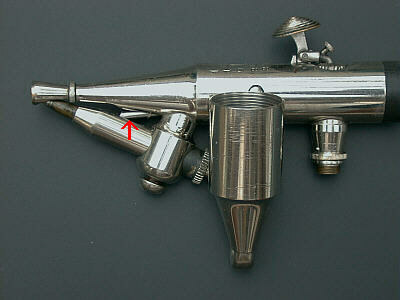 The trigger is similar to a Paasche AB. The difference in the double and single action can be seen in the photo below.